The Blue eyed Cockatoo (cacatua ophthalmica) is native to the forests of New Britain and New Ireland in the Bismarck Archipelago (Papua New Guinea in the western pacific ocean). ; where they are typically found in subtropical/tropical lowland moist forests. They are typically seen in pairs or small groups. Blue-eyed cockatoos are very conspicuous when in flight due to their loud screeching calls. Sadly, this cockatoo is extremely rare both in the wild and in captivity. Therefore, they are a now protected species (listed as Cites II - Endangered Species). The Bare-eyed Cockatoo - also known as Little Corella is sometimes mistakenly referred to as Blue Eyed Cockatoo - however, these two are very different species and look quite different. At maturity they will average between 45 and 50 centimeters (18-20 inches) in length and weigh between 500 and 570 grams (18 - 20 oz). 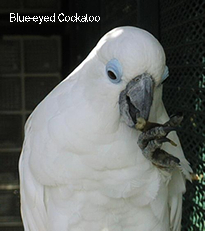 The Blue-eyed Cockatoos get their name from the blue circles of featherless skin around their eyes. Their plumage is largely white, though a striking large yellow and white crest is seen atop their heads. The yellow feathers are behind the white and are often not seen until the crest is raised. Yellow can also be seen under the wings and tail feathers. The beak of the Blue Eyed Cockatoo is black. 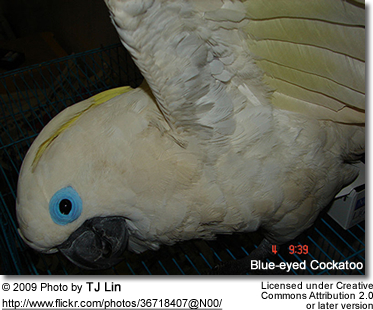 Blue-eyed Cockatoo have zygodactyl grey feet (= the first and fourth toes of each foot are directed backward and the second and third forward. This allows this cockatoo to hold objects and bring food to its beak whilst standing on the other foot. Males and females look alike; but sometimes can be distinguished by eye color. Males traditionally have a black eyes, while the female's tends to be reddish-brown; but this small difference is not a reliable gender indicator. Juveniles of both genders have dark eyes. Blue-eyed Cockatoos mate for life and form very tight family bonds. In the wild, they will typically breed in tree cavities. Captive Blue-eyed Cockatoos will accept appropriately sized nest boxes. The average clutch consists of 2 eggs. The male and female take it in turns to incubate them. The incubation period is about 28-30 days. Both the male and female Blue-eyed Cockatoos will care for the chicks and feed them until they wean at about 14 to 16 weeks. Their natural diet consists of various seeds and nuts, fberries and fruits. They also feed on insects and their larvae. The Blue-eyed Cockatoo is beautiful parrot that is loved and admired by bird lovers throughout the world. The Blue-eyed Cockatoo is reported to be one of the friendliest and most playful of all the cockatoos. They enjoy being handled and are known to be great mimics. The Blue Eyed Cockatoos are rather noisy, both in the wild and in captivity. They are destructive to furnishings and experienced bird owners will provide them with many chew toys and wooden branches, as well as mental stimulation to keep them occupied. Like other cockatoos, the Blue Eyed Cockatoo requires a significant amount of time and attention. Neglect will often result in feather plucking and other forms of self-mutilation. The average Blue Eyed Cockatoo lives 40 years in captivity. Surprisingly their lifespan in the wild is longer, 50 to 60 years. The decreased lifespan in captivity may be due to improper care. What is it: Male or Female?